At the start of December, I shared my first post celebrating your lookatwhatimade moments. I was delighted with the response to that post and thought it was about time I did another one! 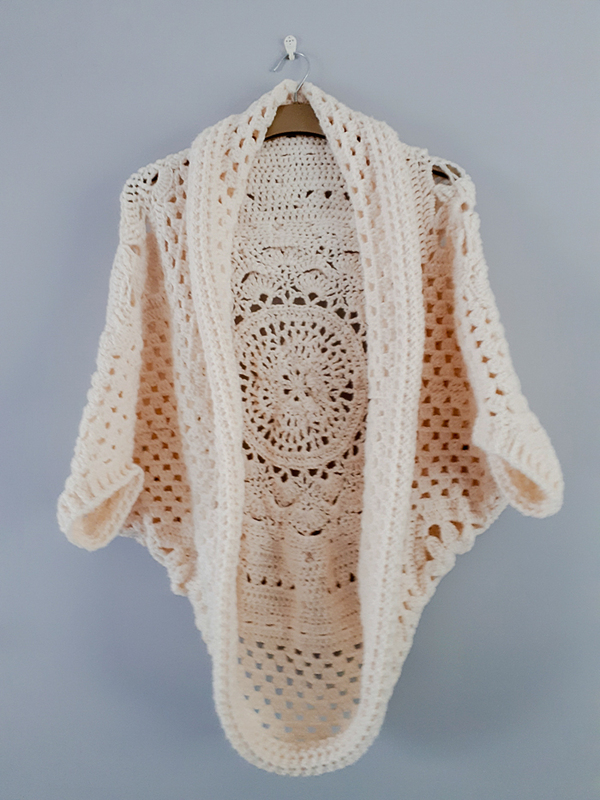 So, my second LAWIM Feature is this lovely Sophie Cocoon Cardigan made by Stephanie Best. 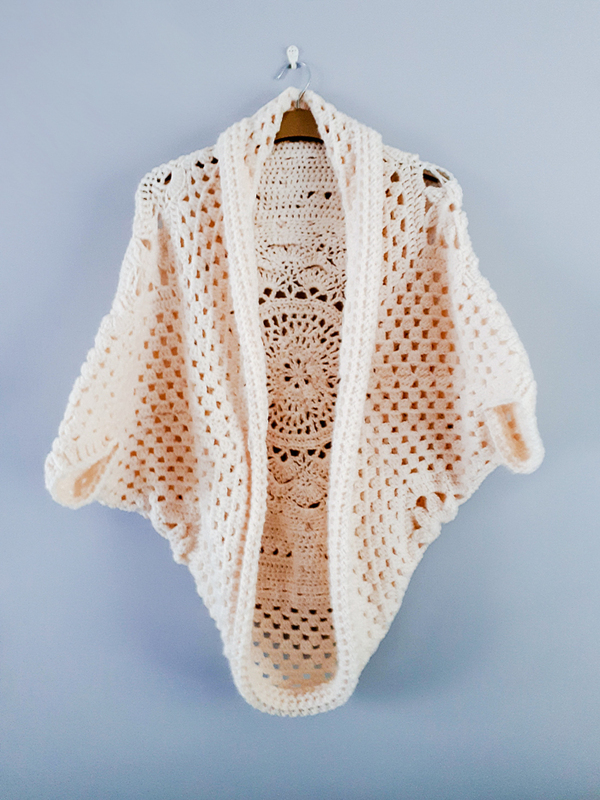 There isn’t an official pattern for this cardigan (which is a marriage of Sophie and Maria Valles’ Cocoon Shrug), but Stephanie has kindly shared some information and photos that will help you recreate it, should you wish to. 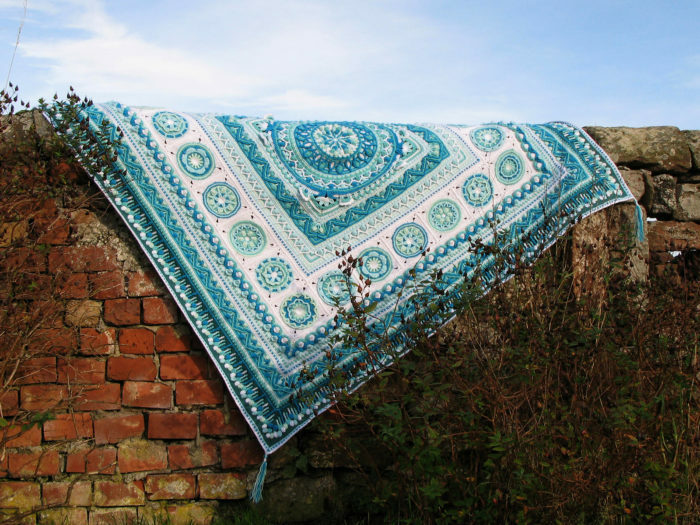 Over the last few years, I have seen enough gorgeous ‘reinventions’ (see Using and Sharing Mindfully at the bottom of this post) to realise that many of you like turning your favourite motifs into garments. I don’t design garments myself, but I really wish I could because I LOVE them. 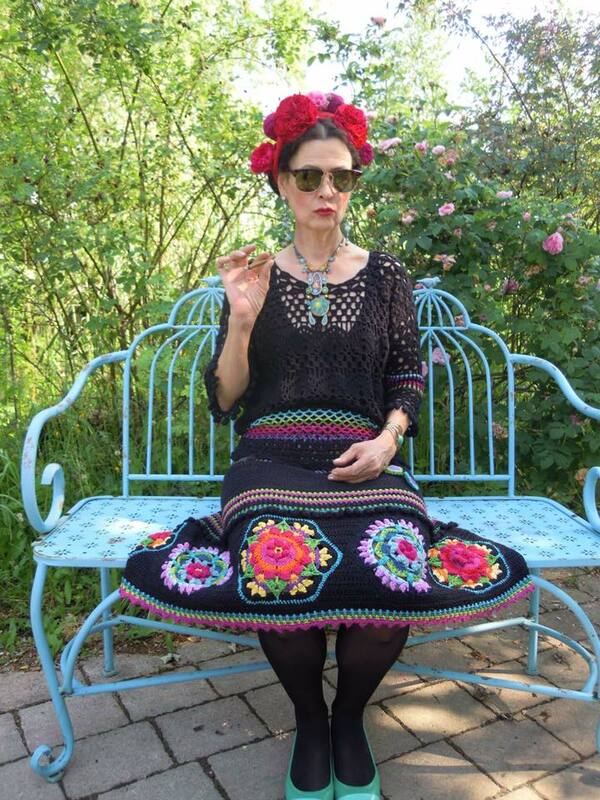 Sometimes, I like them colourful and bold, like this striking dress Gabriele Rauner made by adding elements of Jane Crowfoot’s Frida’s Flowers Blanket to her own design. Isn’t it amazing!? 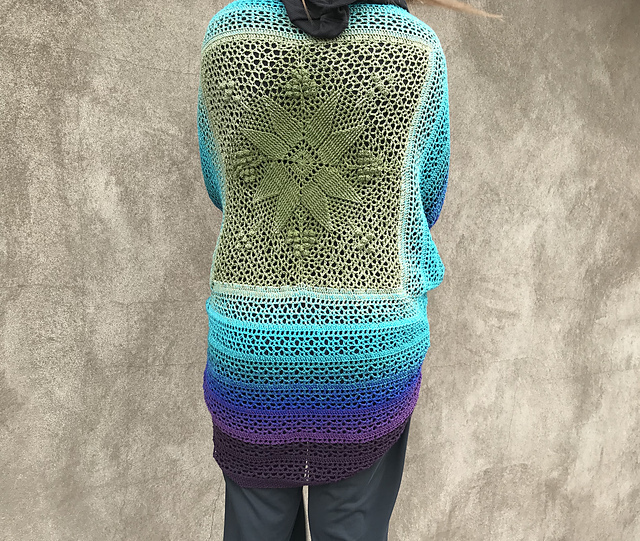 Sometimes, I like them elegant and understated, like this gorgeous fusion Shrug Laura from Taemombo made by marrying Lilla Björn Crochet‘s Fire Square and Indigo Shrug (paid patterns). 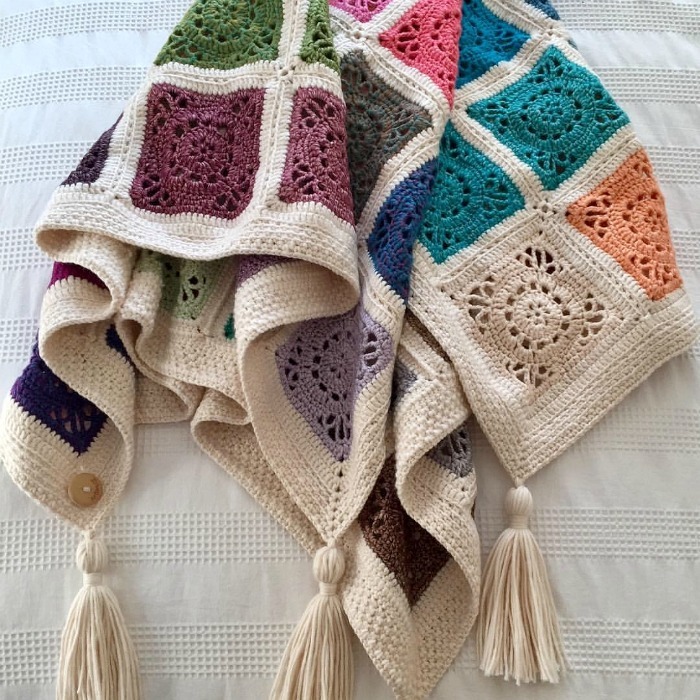 If you scroll down to the last photo on Laura’s project page, you will see that this fusion would also make a beautiful little baby blanket. 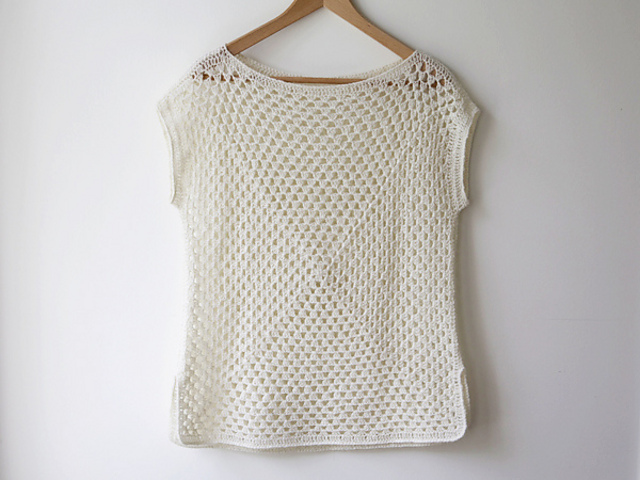 When Stephanie shared the photos of her Cocoon Cardigan with me, my heart leapt! I immediately asked her if she would allow me to share them (and her process) with you. Below, you will find Stephanie’s instructions for turning Sophie’s Garden into a Cocoon Cardigan (or, as I like to think of it, into a squishy warm hug). 600g of a local (UK) store Aran (she doesn’t specify which one). Scheepjes Cahlista – if you prefer pure cotton garments, this striking range of colours will be perfect for you. Stephanie worked Sophie’s Universe up to Round 30 following the instructions below. She then squared it up, using ‘stitches that made sense’ to her. Please note that you can continue to make all 36 rounds should you not wish to figure out how to square it up yourself. When she had a neat square, she added some granny cluster rounds (US dc) before moving on to Maria Valles’ Cocoon Shrug Instructions (more about that in a second). To start Maria’s shrug, you will need a square about 105 cm (41 inches) in width/length (see Size below). Once you have that square, you can follow the instructions HERE. Stephanie didn’t do the suggested double crochet round in Step 1 of Maria’s instructions. Collar: Instead of doing the suggested Step 4 instructions to form the collar, Stephanie used the Step 5 (sleeve) instructions to give her collar a ribbed effect. She also added 2 rounds to make the collar wider. Sleeves: Stephanie added two more rounds to the Step 5 (sleeve) instructions to make them longer. For ‘one size’ or UK 10-18, make sure your square is around 100cm BEFORE joining the sides to create the sleeves. Stephanie stopped at 90cm to give her a finished UK Size M (8-12). Writing these Look At What You Made posts makes me extremely happy. It goes without saying that it delights me to see people making my projects as they are, but there is a different kind of satisfaction and happiness that comes from knowing that someone has taken one of my designs (or part thereof) and adapted it in their own way. Sometimes they use it to fuel their own designs, like with the Emma Square Blanket Hazel Raven made a couple of months ago for my first Your LAWIM Moments feature. 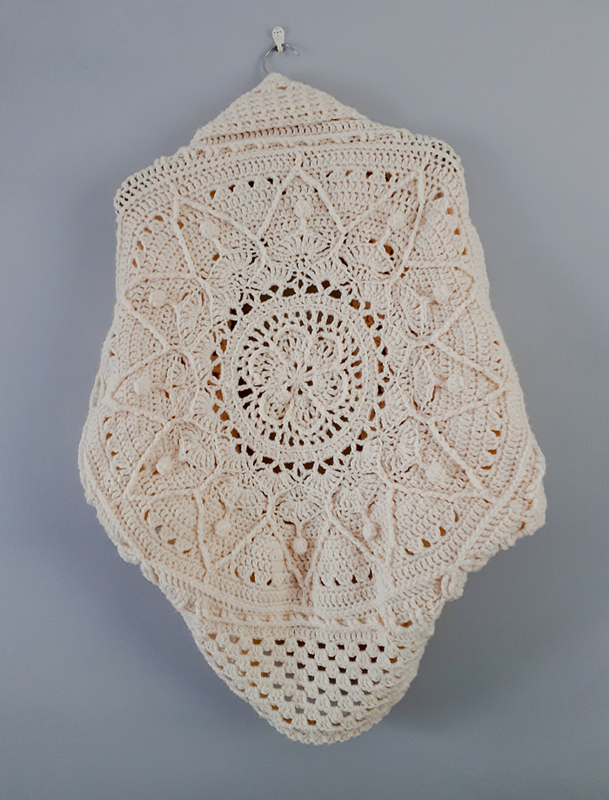 Sometimes they marry it with other designs by other designers, creating items like the gorgeous Sophie Loves Lilla Bjorn (the PDF for this free adaptation is thorough and represents an epic amount of work by Emma Aldous who created it). When people do that – marry my designs to other people’s designs -it gives me an opportunity to discover designers I might not have heard of before. In this case, Stephanie’s Cocoon Cardigan has introduced me to Maria’s wonderful designs, for which I am MOST grateful. If you have a moment, and if garments are your ‘thing’, I think you will really enjoy exploring Maria’s designs. Maria’s Amma Granny Square Top, for example, is simple and elegant. I think it would look fantastic in Whirl. It would use less than one ball of Whirl and I know a lot of people have Whirls in their stash but aren’t quite sure what to use them for. They are so pretty to look at that one almost doesn’t want to use them! If that is you, and this pattern tickles your fancy, go for it! If I ever make this top, I would make one side starting from the outside of the Whirl and the other starting from the inside. Maria also has an e-book for sale on Ravelry. It is called Rove Handmade Volume 1: Grannies, and contains 4 elegant granny square shrug patterns. There is a huge difference between using parts of a design (crediting and linking to the designer) and taking a design (or part thereof) and sharing it as your own work. Dolce and Gabbana recently released an ensemble that was heavily and quite clearly inspired by parts of Jane Crowfoot’s Frida’s Flowers and Lilly Pond blankets, with no credit given to her as having designed those elements (you can see her Instagram posts about it HERE). If you incorporate elements of a design to create something unique and wonderful, please remember to credit the designer/designers that inspired you and, wherever possible, link to their original instructions (which remain their intellectual property) so that other people can discover them too. It is also a good idea to open a dialogue with the designer if you choose to share how you have used or modified their designs. Not only will it bring them joy to see how they have inspired you, it will also introduce them to your work. I have made a few really good friends this way and I am eternally grateful to them for reaching out to me. Want to see more Sophie Projects? This is such a beautiful work! Congratulations! Oh my gosh I was missing you and then today I saw your email in my inbox. My heart leap for joy!! So happy to see your post! I always look forward to them. At the same time I am happy you can share more of your time with your boys and MrLAWIM.! Thank you for this new project. Praying the Lord is blessing you. I am thrilled to see Bendigo Woolen Mills getting a mention. Ive been using their yarns for years now and if you like natural wool or cotton or bamboo they are certainly worth looking at. The Balls are a huge 200g and very cleap by comparison. they have a lot better colour choice now than they did and often have very good specials. Im entering my effort of your sophies iniverse in my local show this year so wish me luck with the blocking which ive yet to do. I made mine with Bendigo wools and their bamboo/wool so its heavy. Thank you Dedri!!! You have greatly inspired many!! !